Salford Red Devils are about to celebrate the culmination of 3 years work as part of their Big Lottery funded Tackle Unemployment programme. 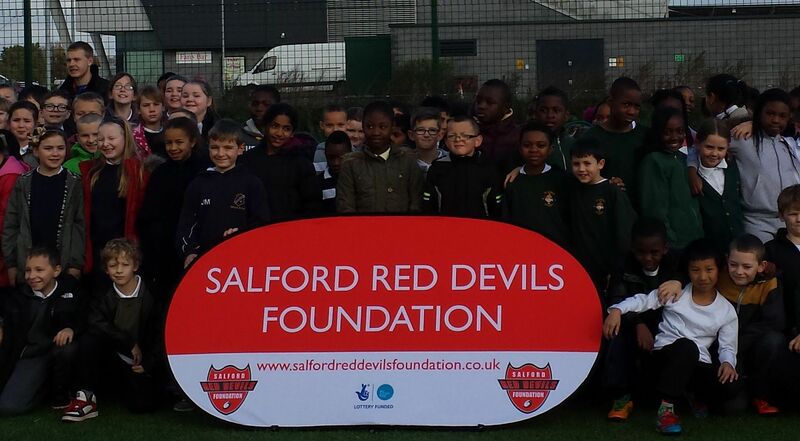 Since April 2011 the Foundation has successfully worked with 100s of young people aged 14-21 across the whole of Salford. The Tackle Unemployment programme was conceived originally by a willingness of local young people to engage with a professional sports club outside of the traditional classroom setting. We set about to help improve local young people’s self-esteem, attitudes towards work and the local community, as well as providing a service for local community sports clubs. Secondly, SRDF then take these newly qualified young people on to our Volunteer Development Programme where they use their new skills to deliver activity sessions in schools and community clubs. Part of our 3 year aim was to engage an additional 5000 residents this way and this target was met with more than 6 months to spare. As a direct result of this project we have greatly developed our partnership base and grown relationships with organisations such as Greater Manchester Police, Lloyds TSB Foundation and Salix Homes, which have had many fantastic spin offs. The latest project we are launching is a social inclusion programme based at our former home ground, The Willows, to help replace some of the activities lost after the club moved on.